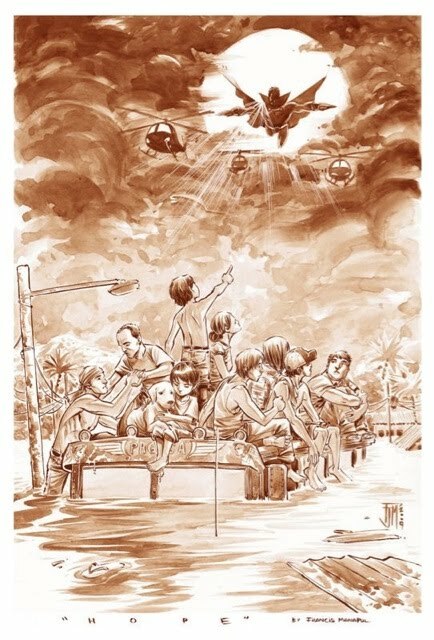 Upcoming Flash artist, Francis Manapul has tweeted this image he has done, to be included in a book created to raise funds for the flood ravaged Philippines. Titled 'Hope' Manapul even manages to convey a 'down-home' feel in the middle of a natural disaster. In a similar style to his run on Superboy in Adventure comics, all the locals are perfectly rendered as they look to salvation from the skies. At first I assumed it was Superman flying to the aid of the isolated locals, now it looks more like Captain Marvel - nice choice! Beautiful piece--the colors and tones make it look a little Eisner-esque to me, at least looking at it in the smaller form. Thanks Rob - nice to know I'm not the only one who picked up the Eisner-esque style!